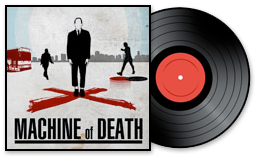 Machine of Death » Announcing the free PDF download of MACHINE OF DEATH & the free podcast. Ebook & Updates 02 Nov 2010 09:50 pm by David ! Announcing the free PDF download of MACHINE OF DEATH & the free podcast. 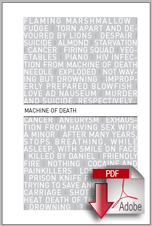 Please find below the entirety of Machine of Death as a free, downloadable PDF. In a word: no. You have proven time and again that you are willing to pay for content that you find valuable. You have shown that you are driven to share material that you fall in love with. And we are committed to ensuring that you can experience our work whether you can afford to buy a book or not; whether you live in a country that Amazon ships to or not; whether you have space in your life for a stack of paper or not. Please, download, read, share and enjoy! These files are DRM-free and released under the Creative Commons Attribution-NonCommercial-NoDerivatives license. This means you are free to download them, share them, email them, copy them, print them out, seed them, torrent them, and generally send them about however you like, provided that the manuscript remains unbroken, that attribution is always given, and that all use remains noncommercial. Many of the stories themselves are further released under the Attribution-NonCommercial-ShareAlike license, which also permits non-commercial adaptation of the work into other media. See the back of the book for full copyright information. 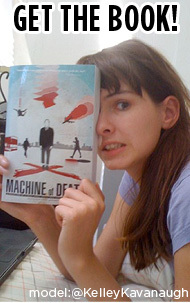 Machine of Death in the Amazon Kindle Store – $9.99 $5.99. Available for download worldwide, right now. DRM-free. Machine of Death in the Barnes & Noble Nook Store – $9.99 $5.99. Available for download right now. DRM-free. 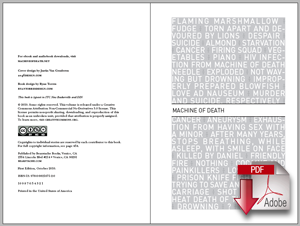 Machine of Death as a downloadable ePub – $9.99 $5.99 from us, via Gumroad. 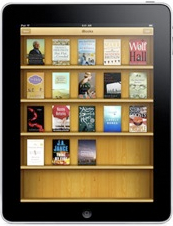 Machine of Death in Apple’s iBookstore for the iPhone/iPad/iTouch – $5.99. Available in all the markets that Apple allows us to sell to. PODCAST. Starting today, we will be releasing about one story a week in audio as a free, Creative-Commons-licensed podcast. We’ll also be posting each episode here on the site. The first one’s up now — you can go listen right this second! http://feeds.feedburner.com/machineofpodcast. Plug that into your favorite podcasteater! I’m broke right now and will be reading this but you guys are #1 on my to-buy list (behind food, ahead of liquids). Thanks! Have you guys considered putting this up on SiSU? Charles Stross put his free book Accelerando there to great effect, as did Cory Doctorow his book Little Brother. Is there any chance you would release the book on the Barnes and Noble site? I am grabbing the book for my nook and if I like it I’d like to be able to buy the official nook version. Gah! Missed the announcement under kindle. Forget I said anything. Thank you for providing free ebooks to those who cannot afford them. Thank you for protecting the reader’s right who chooses to buy the ebook by not restricting it through DRM. Yaaay! Just bought the Kindle version. Love your work. My school blocks dropbox! Where else is it hosted? I am in literal awe of your awesomeness, guys. Your awesomeness continuously generates surplus awe. I will be both reading and listening to Machine of Death tonight! For free! I haven’t been able to afford the book yet as I’m looking for a job. I planned to get a copy as soon as I had some money to spare and I still will. There’s a place on my bookshelf all ready and reserved for it. Thank you so much, guys. You are rock stars. @Scott — I added some direct links to the post above! Thanks so much, I got it! Now I can get started while my book makes it’s way here! NOOOOOOO! Amazon despises shipping to the Bahamas so I will have to deal with free wallets for now… However you have a buyer in 11 months when I return to the continent. <3 Dino Comics and you guys 'cause you make me TRIP ALL THE BALLS. I love you guys so freakin’ much. You rock so much that you shine !!! And smoking crack is particularly bad !!! Super Awesome! I love your work! I am a seminarian living in the Philippines and i’ve been following your work for the past four years and i would have bought your book if only they could ship it abroad. Thank you for offering this online. More power to you! Hey guys– while I *totally* appreciate the freebie (PDF is a compatible format for the nook ereader) I would have happily paid for the sucker, as well; HOWEVER, the Kindle format is not nook-friendly. So yeah, thanks, and here’s my invisible cash! I have a Nook, but hate DRM. Is the forthcoming NOOKBook formatted any differently than the DRM free ePub available directly from here? Alternately, does/will Barnes and Noble distribute without DRM? Ultimately, do you guys make more profit if we buy directly from you, or are sale numbers at the big sellers more important to you? Wow! I can’t thank you enough for making this free. Consider this an investment, folks, for as soon as my piggy bank refills itself, magically at some point in the not so distant future (I really hope), I’m so buying the hell out of this book. I downloaded the free version and reward myself at work with periodic breaks to read the stories. I’m rationing myself because they’re so good I want to read them all right now, but I want to savor them too. Every single one so far has been outstanding! Thanks for being so goddamned great! I read the free version, and then my bf got the kindle version, and now I plan on buying my little brother the print version for Christmas. Awesome, awesome stuff! Are you guys thinking about releasing some of the other stories that didn’t make the cut, in some format? Have people posted them anywhere? I can’t get enough Machine of Death! I was just about to order this on amazon, i don’t live in the US so shipping would have killed me. i dare say sirs, you have just won all my internets.